I love cheesecake desserts especially the light ones. It is a relatively easy dessert to put together and you really do have a wide choice of flavours to be added as well as how you plan to serve it. You also have a choice of a baked or unbaked cheesecake. However I personally prefer the individual portions as it is pretty as well as easy to serve. No messy slicing and having crumbs all over the place. The next time round I would love to put together a cheesecake pots version - cheesecake desserts served in a glass. I think this is a totally cool way of wowing your guests! 1) Preheat oven to 375 degrees. Make crust: Butter a 9-by-3-inch springform pan. In a food processor, pulse graham crackers until fine crumbs form; add melted butter, sugar, and salt, and pulse to combine. Press crumb mixture into bottom and about 1 inch up side of pan. Bake until set, 12 to 15 minutes; let cool on a wire rack. Reduce oven to 325 degrees. 2) Set a kettle of water to boil. Make filling: Using an electric mixer, beat cream cheese on medium until fluffy, scraping down side of bowl. Gradually add sugar, beating until fluffy. Beat in lemon zest and juice, and salt. Beat in eggs, one at a time, scraping down side of bowl after each addition. Beat in sour cream. 3) Wrap bottom half of pan in foil. Pour in filling; place in a roasting pan. Pour in boiling water to come halfway up side of springform. Bake until just set in center, about 1 3/4 hours. Remove pan from water; let cool 20 minutes. Run a paring knife around edge; let cool completely. Cover; chill overnight. 4) Add 1 1/2 cups of fresh or frozen blueberries in a saucepan. Add 2/3 cup sugar, zest of one lemon and 2 Tbsp lemon juice with the berries. Put the pan on medium fire and once bubbles appear on the sides, bring the fire to low. Reduce the fruit on low heat until it becomes a thick jam consistency. You want some of the fruit to be chunky for texture. Cool and refrigerate. 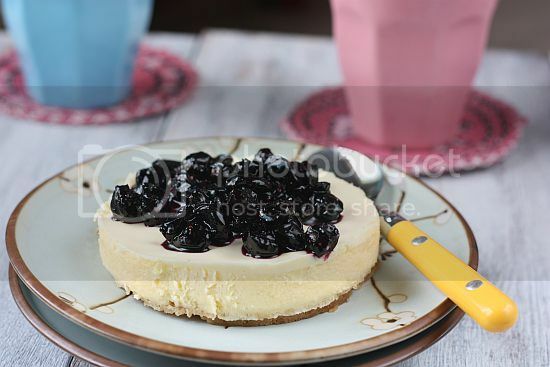 5) To serve bring cheesecake out from the fridge. Set to room temperature for about 4-5 minutes. Top with blueberry compote before serving. 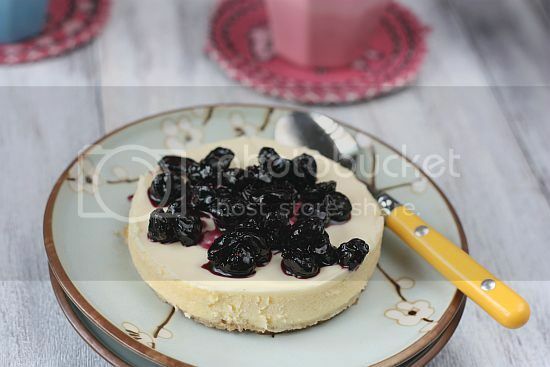 So elegant and stylish cheese cake. It was so awesome to see your name in my comment section again! 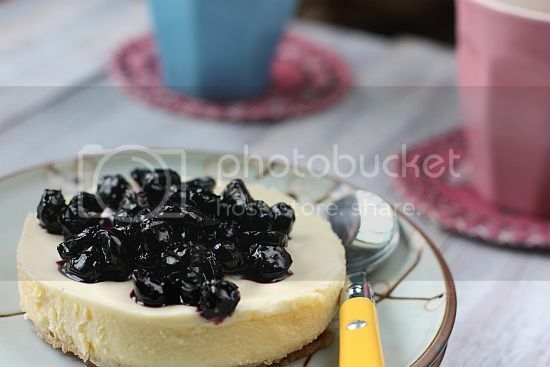 Your blog looks beautiful, and this cheesecake looks fabulous, the perfect blueberry topped cheesecake! I like individual cheesecakes too..probably so I'm not tempted to eat a whole one lol Loving those Pandan-Coconut Melting Moments too! Bookmarked! 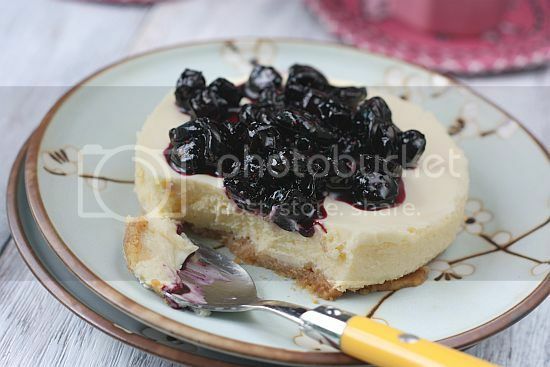 Blueberries and cheese cake is another one of those tried and tested combination. Love the fact that you've used a compote to top the cake. It looks yummy.. Thank you so much for the recipe. Great recipe and good looking also, I want to try it. I just found this blog and have high hopes for it to continue.I have added to my favorites. Thank You….